What it’s about: Baseball! Wholesome, nostalgic, poetic baseball. Also, lots and lots of wholesome, nostalgic, poetic cocaine. Yes, like all celebrities in the ’80s, many of your favorite baseball players were getting high on their own supply, resulting in one of the biggest scandals in baseball history erupting at the end of the 1985 season. Biggest controversy: Despite that description, the scandal wasn’t big enough to merit much punishment. While Keith Hernandez suggested that 40 percent of Major League ballplayers were using coke, only 11 players were implicated (Hernandez among them), they were granted legal immunity, and while they were ostensibly suspended from the game, Baseball Commissioner Peter Ueberroth commuted their suspensions in exchange for community service, and a percentage of the players’ salaries donated to drug abuse programs. Strangest fact: Even a parrot was caught up in the drug ring. 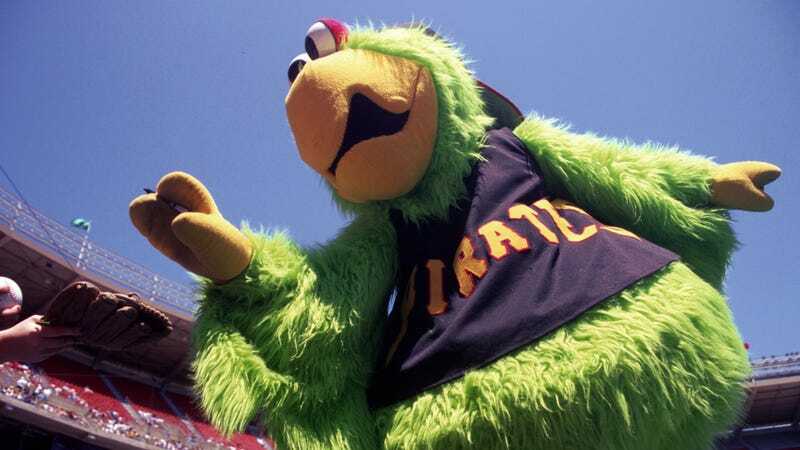 Pittsburgh’s clubhouse was a haven of drug activity, and Kevin Koch, who played the Pirate Parrot was a go-between for players looking to find a dealer. (Wikipedia doesn’t address the rumors that he stashed coke inside his costume’s oversized parrot head.) The Phillies’ clubhouse caterer was also selling more than just hot dogs, as he went to jail on 11 counts of selling coke. Thing we were happiest to learn: And no one in baseball ever used an illicit substance again. Ha, we’re totally kidding. In fact, when Ueberroth, less than two years after the scandal, declared baseball to be drug free, he was laughed at. If ballplayers did abandon cocaine, it was only for a different drug, as baseball’s next big scandal would involve the widespread use of steroids. Thing we were unhappiest to learn: The guilty players’ careers were barely affected by the scandal. Tim Raines, who claimed he only slid headfirst so as not to break the vial of coke in his pocket, was not suspended, and is now in the Hall Of Fame. Hernandez and Dave Parker were All-Stars for several seasons after the scandal, although neither are in the Hall, and the scandal is assumed to be the reason for that. The only player to suffer direct serious consequences was pitcher Rod Scurry, who died of a cocaine-induced heart attack at age 36. Best link to elsewhere on Wikipedia: The Pittsburgh trials page links to a myriad of other doping scandals in sports, none more bizarre than abortion doping. During the Cold War, rumors persisted that Soviet athletes were getting pregnant for supposed physical benefits and then aborting the babies before the second trimester. The surge in hormones that accompanies pregnancy includes testosterone, which aids muscle growth, and relaxin, which loosens joints, although Wikipedia points out that any perceived benefits are more than balanced out by morning sickness and fatigue. At any rate, the bizarre allegations were never proven, and Snopes.com concluded the stories are largely based on one dubious interview with a retired Soviet gymnast, and have persisted only because they’re often used in “poorly sourced arguments” by the anti-abortion movement. Further down the Wormhole: A coked-up parrot isn’t the only questionable part of Pirates’ fan culture. In 1966, team trainer Danny Whelan taunted an opposing pitcher while waving, “a green rubber hot dog,” in the direction of the mound. Wikipedia does not record why or how the Pirates’ trainer had a green rubber hot dog on his person, but he started a trend, and plastic replicas of the Green Weenie were distributed to fans, who would shake them to provide good luck to Pirates’ players or bad luck to their opponents.